We want to tell you more about our INDIEGOGO REFERRAL CAMPAIGN. Please take a few minutes to help us spread the word through email and social media and earn referral rewards! You earn $50 in Zami credit towards our campaign every time one of your referrals purchases a Zami. The amount of credit you can earn is unlimited! Once the campaign is over, we will apply this credit to your account, giving you a refund on your purchase OR credit on the purchase of a new Zami Wood, Aluminum or Smart. Please note: Contributors cannot receive referral credit for referring themselves and of two contributors, only one can be the ‘referrer’ and receive campaign credit for the other’s contribution. If 5 of your friends purchase a Zami, then you will be credited $250! YES, that’s right… you can get yourself a free Zami Essential by sharing our campaign!! You must refer people using a unique URL that is generated through your Indiegogo account. This unique code is linked to your profile so we know when you have referred the campaign to a friend, and we know who to reward! HOW DO I FIND AND USE MY UNIQUE URL FOR MY REFERRALS? Simply login to your Indiegogo account if you already have one, or create an account by signing up. If you already claimed a Zami perk, then login with the same account you purchased your perk. 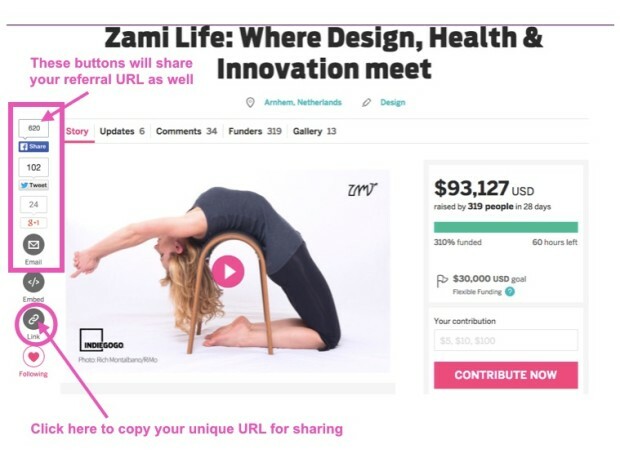 Visit the “Zami Life: Where Design, Health and Innovation meet” Indiegogo page to find your unique URL. 1) Look to the left of our featured and video you will see a grey ‘link’ button (circled below). If you click the button, your unique URL will pop up. You can now copy your URL and share via social media (FB, Twitter, Google+, Instagram, etc. ), text, or email. 2) You can also click on the social media buttons (in the square below) to share your unique URL. 3) The last way to share is when you visit our campaign and claim a perk. A confirmation email will appear in your inbox. Scroll down to the bottom of the email. HOW DO I KEEP TRACK OF MY REFERRALS? 4. In the navigation bar, click on the ‘Referrals’ tab. 5. You will see the number of people you have referred, the number who have purchased a perk, and the total dollar amount of their contributions. How do I redeem my credit or my free Zami? Once the campaign is over, we will have detailed information on how many Zami’s were purchased through your referral URL, and at what perk level. We then either, issue you a refund on Zamis you have purchased, or issue you campaign credit towards the purchase of your Zami. You are doing something wonderful for your friends by sharing our campaign and helping us reach our goals. Thanks to you, your friends will be able to improve their health and posture. Happy Sharing and Good Luck!